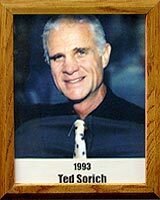 Ted Sorich got into sports during high school in Bisbee, Arizona, in the early 1950s. Like many youngsters in smaller towns, Ted played it all – football, baseball, basketball and track – experiences that came in very handy in his later years at Northern Arizona University, where he excelled in several sports. He was named MVP in the 1958 Small College Football Playoffs, the same year he played in the Holiday Bowl. Ted went on to become football offensive coordinator at NAU, head coach at Round Valley High School (North Coach of the Year, 1965); and head coach at Flowing Wells in 1966. He was chosen head coach of the South in the 1967 annual North-South All-Star game. His head football coaching record stands at 40-7-3. Ted served on the Board of Directors of the Pima County Sports Authority, as well as the Arizona Football Hall of Fame, National Association of Athletic Administrators (given the Distinguished Service Award), the National Association of Secondary School Principals and numerous other organizations. An athletic administrator (including that of Flowing Wells Unified Schools District Athletic Director) for many years at the high school level, Ted was active with Special Olympics and Continental Little League and was the formulator of a plan for the alignment and classification of all high schools in Arizona, which resulted in five conferences being formed. He also devised a financial plan which was adopted to provide financial stability to the Arizona Interscholastic Association through membership dues, participation fees and revenues from state playoffs and tournaments.